So I had a few minutes today to take the car out for a spin. Unfortunately, most of it was in stop-and-go traffic, so I was unable to fully explore what the DTM-II could do. I plan to take the car out for a spin in the mountains or track soon, after which I promise to provide a full report on the driving experience. However, I was able to shift between the various settings, G-1, G-2, G-3 and A-1, A-2... and yes there IS a difference, EVEN in city traffic. There is a marked delay in how quickly the ATTESA sends torque to the front wheels, for the G settings versus the aggressive A settings. Even amongst the G settings, I noticed that G-2 (Tarzan G-box) appeared to react the quickest. 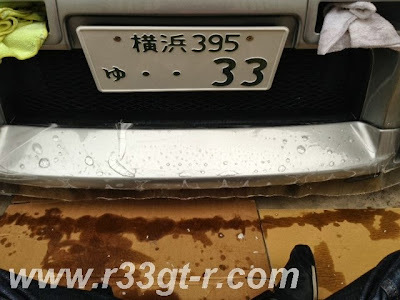 However, it was in A mode where I saw the front torque gauge meter needle shoot up to the max of 50kg...in the other modes I saw the needle go up to 10kg consistently, which Ito-san had told me is about 30% power to the front. So my next task is 1) to take the car on a fast drive, and 2) to play around with the driver programmable settings. Apologies for the relative lack of information in this post, but schedule permitting I hope to be able to at least do one track day before year's end. 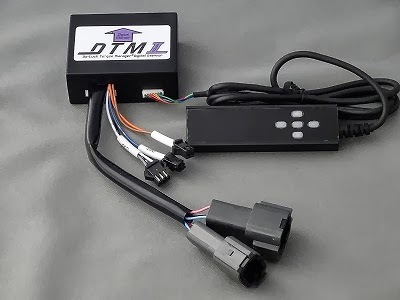 Once installed, the first thing you will need to do is ensure the DTM-II unit "learns" the voltage outputs for closed and open throttle positions on your particular car. Here is a video clip where Ito-san and I demonstrate how this is done. Ok so now we're ready to roll... except you'll need to figure out which setting you want! There are 7 settings for the DTM II: 4 in "G" mode (displayed as G1, G2, G3, and G4), and 3 in "ARX" mode (displayed as A1, A2, and A3). Here is a video I shot (at night, sorry it's blurry - the actual device is super crisp and clear) that shows how to switch between the various settings. Before I describe each of these settings, we first need to review what the DTM II device is doing. 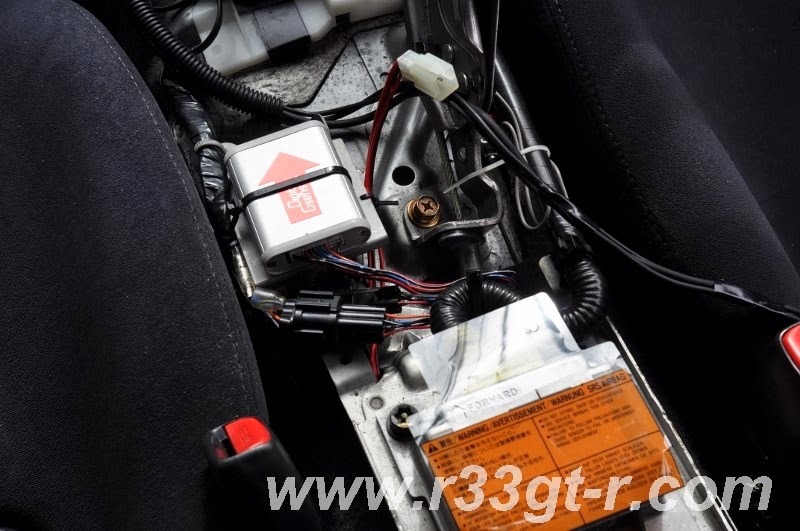 Recall that the ATTESA ECU bases its decision making on various inputs, 3 of which are, the car's longitudinal and lateral G forces (from the onboard G-sensor), and throttle position. Here is a diagram showing the ATTESA map in 3D, showing just how G forces affect ATTESA output. The right axis is lateral acceleration, the left axis is longitudinal acceleration, and the vertical is amount of power going to front wheels. 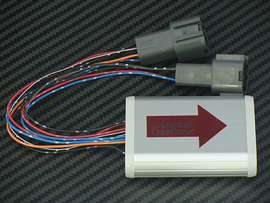 The impetus of Do-Luck to develop its original Digital G-sensor was that due to age, the OEM G-sensors, which are analog devices (basically a pendulum in oil), were degrading to the point where the signals being sent to the ATTESA computer were inconsistent, slow, weak or non-existent, thus preventing the ATTESA from performing as it should. And an OEM replacement cost somewhere around 130,000 yen and were still analog. Digital G sensors are now commonplace (most smartphones have them), are inexpensive, ultra accurate, and fast. 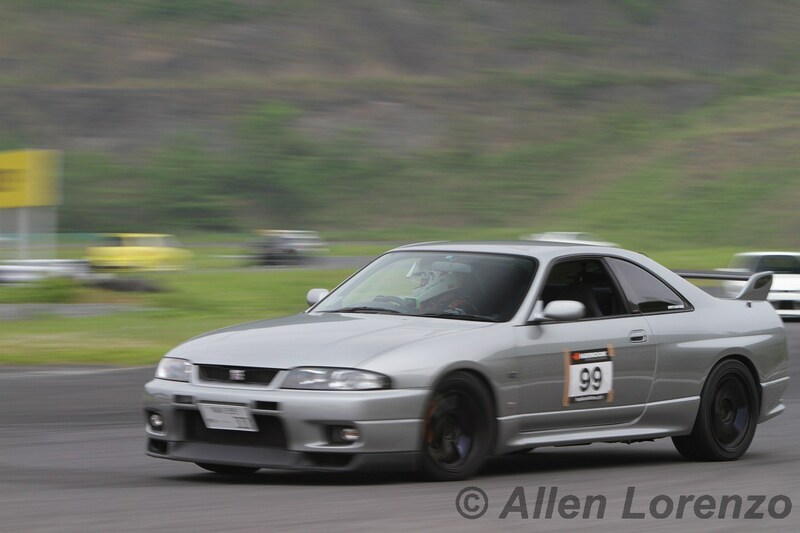 So it was only natural that the Digital G-sensor was developed. 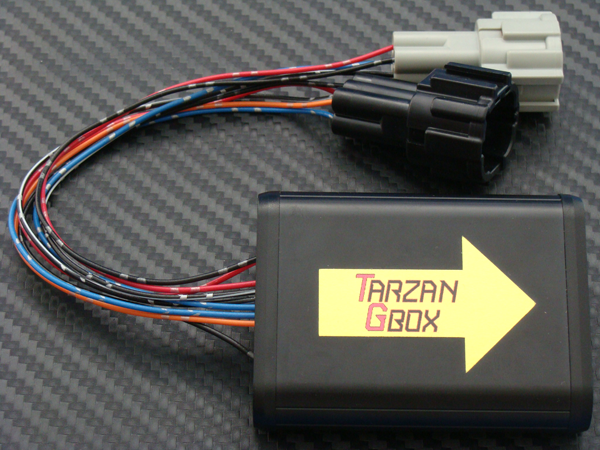 Both this Digital G-sensor and the Tarzan G-Box, however, do not simply send back the actual raw G force data to the ATTESA ECU. 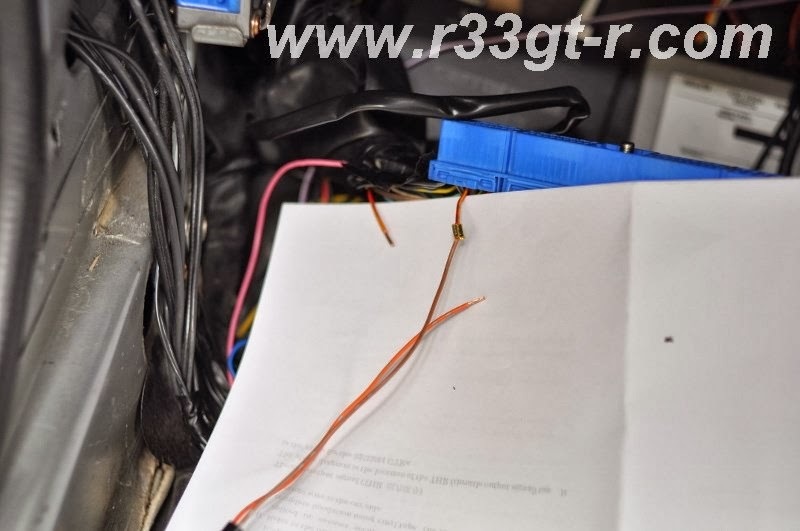 Both devices actually modify the signal being sent by multiplying the actual raw G reading by a pre-set variable (or set of variables, in the case of the Tarzan G-Box), which, as can be seen from the map above, means that the ATTESA is engaging faster than before because it believes that the car is experiencing higher Gs than it really is. As an example, if the car is actually experiencing an acceleration of 0.3Gs, but the Digital G-Sensor multiplies that number by a pre-set number, say 1.5, so the ATTESA thinks the car is accelerating at 0.3x1.5=0.45Gs. 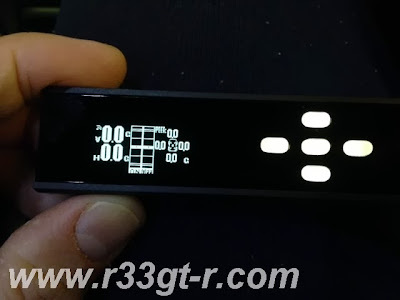 In "G" mode, the DTM II is acting as a standalone G-sensor. Specifically, in G1 mode, the DTM-II unit is outputting the same modified G signals as the Do-Luck Digital G-Sensor; in G2 mode, the unit is outputting the same modified G signals as the Tarzan G-BOX; however in G3 mode, the unit is outputting what the OEM unit would have put out when new (i.e., a "pure" unadulterated G signal). 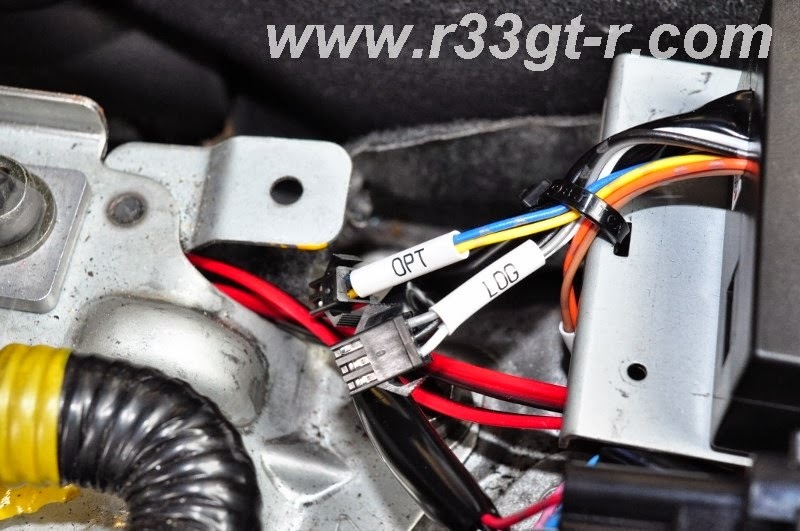 G4 mode is user programmable - that is, the user can choose by what percentage each of the 4 (front, rear, left, right) G forces should be multiplied by, as sent to the ATTESA ECU. 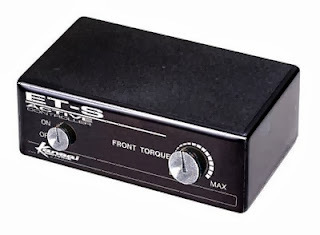 The user can choose an amplification between 0% to 200% for front, left and right G forces, but for the rear G force (i.e. 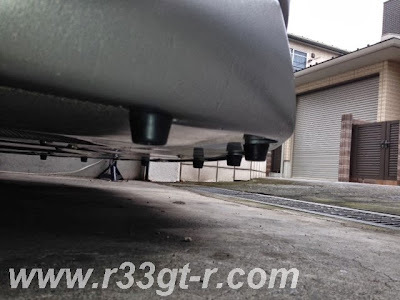 braking), the amplification range is between 100% and 115%. So what is ARX mode? Remember with the G mode settings, the raw G-force signal was amplified by a set variable. In ARX mode, the throttle position comes into play along with the G-forces (however there must still be enough G-forces first, as throttle position alone won't activate ATTESA). 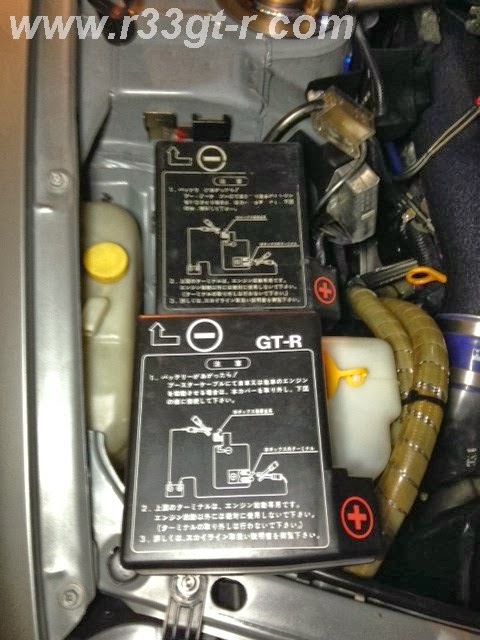 Further, unlike in the G modes where the raw G-force signal is essentially only "multiplied" by a set variable, in the ARX modes both the throttle signals and G-force signals are outputted according to a unique "map" (still based on the original ATTESA ECU map). Ito-san explained that, rather than a linear output (where all the incoming data is mutliplied by the same variable), in ARX mode each data point is specifically associated with a specifically amplified (or de-amplified) data point which is then sent to the ATTESA ECU. Ito-san calls A1 mode the "street" mode, and the A2 mode the "circuit" mode. 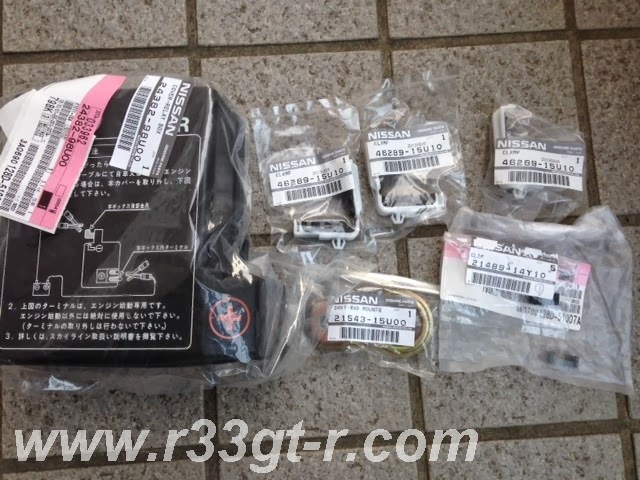 A3 mode is again a "pure" signal mode for both G forces and throttle position. 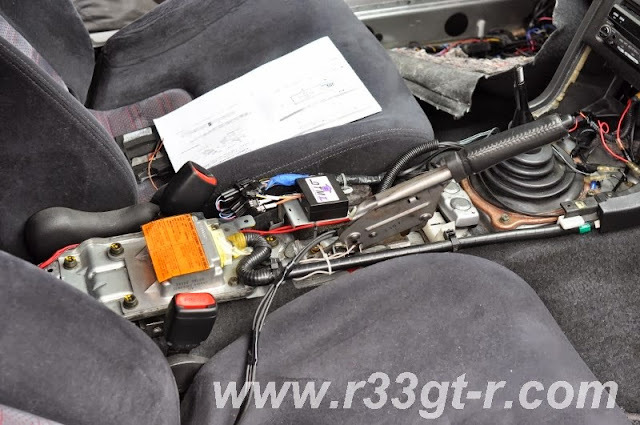 Speaking of throttle position, the user can also adjust the throttle position signal being sent to the ATTESA unit, as I show in this next video clip. Note that I was getting tired and lost my train of thought at about the 2 minute mark, and mistakenly said that at 100%, I would get the "maximum of the ATTESA working to pull me out of the curve." Note this is only true if there are G forces in play as well, as noted earlier. Also during the video at around the 3 minute mark, I referred to the Optional Map Edit, which refers to one of the two leads which the DTM II has. 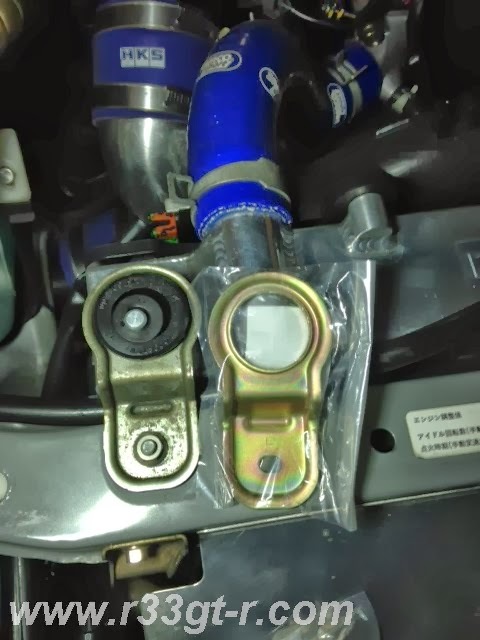 Originally, the OPT lead (as shown below) was designed to hook up to the AYC in the Lancer Evolution cars (this unit works with them as well); however as I mentioned in my previous post Ito-san is working on using this to control the Active LSD found in V-Spec 33 and 34 GT-Rs. So that's pretty much it for now. I apologize if I left anything out or was unclear. 2) The difference between the DTM-II and something like the below, is that traditional ATTESA controllers only amplify the signal from the G-sensor. 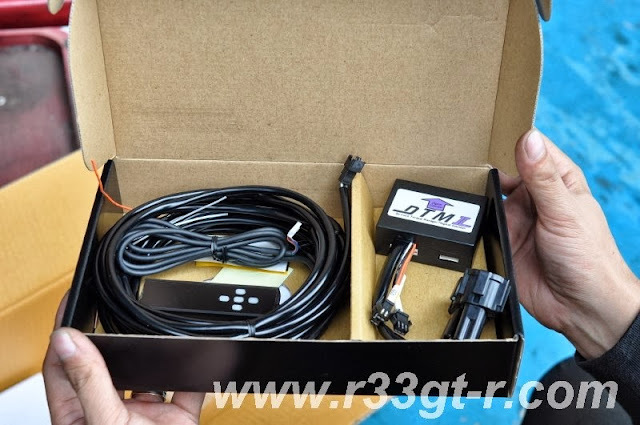 The DTM-II has its own G-sensor, and further allows for manipulation of the throttle signal. 4) Is it possible to change the ATTESA "map"? No, because that map is onboard the ATTESA ECU. 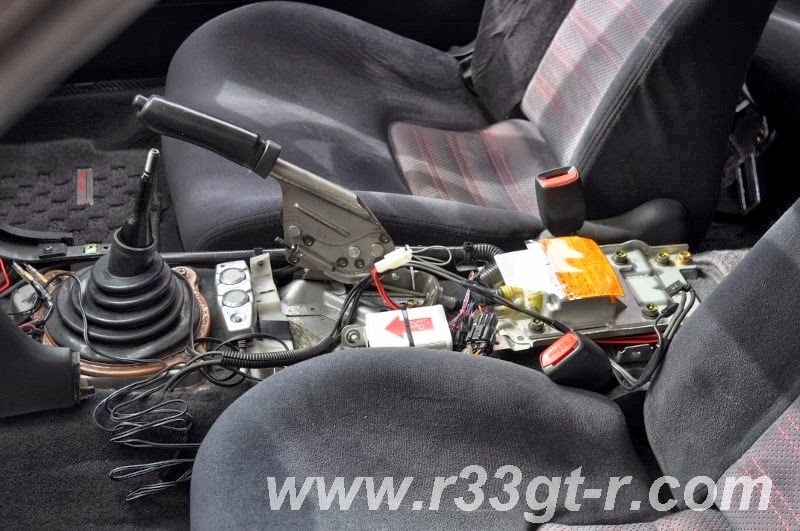 However given the ability to send different and amplified G and throttle position inputs, it is possible to use only certain sections of that base map (e.g. the most aggressive portions), or distort the map so that the ATTESA unit's lowest/highest thresholds are raised, lowered or both. In my next blog post, I'll post my driving impressions, as well as address anything else I left out! Leave a comment or question if you have one, thanks! 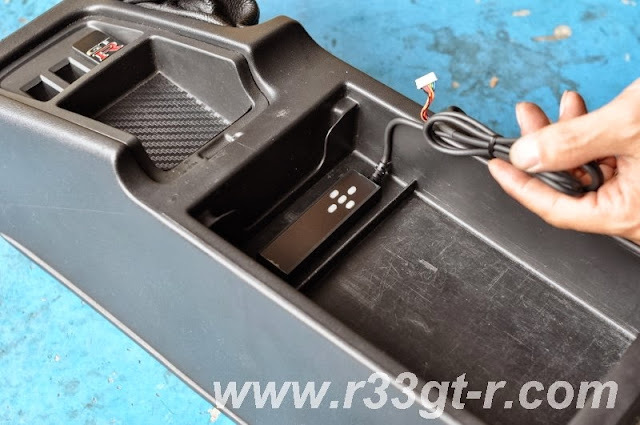 To review, the Do-Luck digital G-sensor devices (both the Digital G-Sensor model and the Tarzan GBOX) replace only the OEM G-sensor, located under the center console in the RB26 GT-Rs. 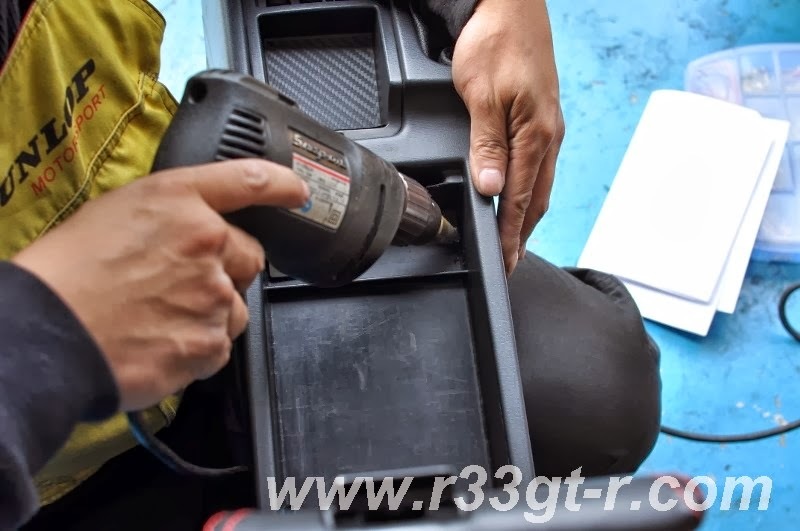 The first step is to remove the shift knob, shift knob surround, and ashtray, and then undo the screws holding in the center console, in order to access the G-sensor installation location. 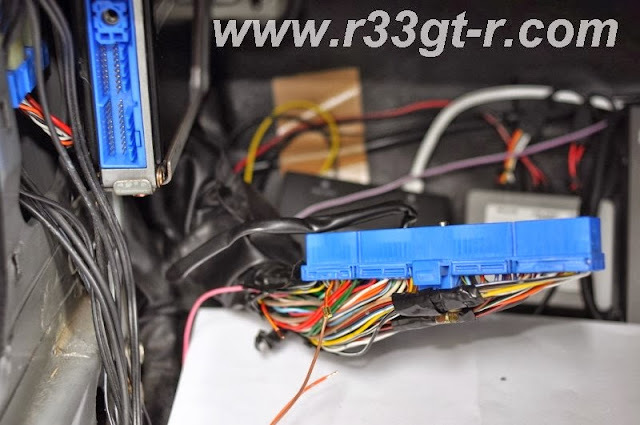 In my case, in my effort to keep my car looking as stock as possible, I chose to install the EL display unit inside the console box (and thus chose to give up the ability to be able to read the real time G readings displayed by the unit). 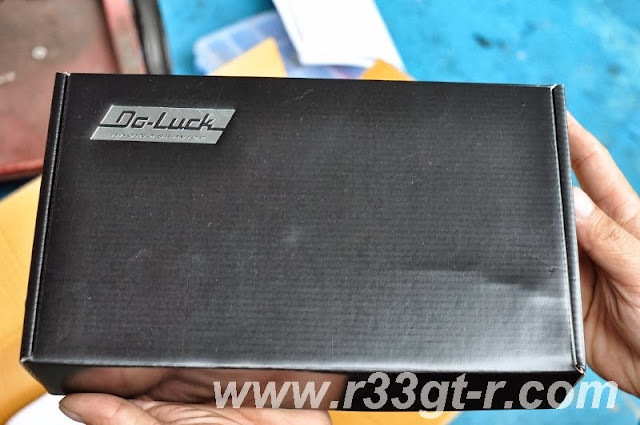 Once the console box is removed, step back and review the scene: In my case, as I had previously installed Do-Luck's Digital G-Sensor, the gold OEM analog box was no longer there. Remove the old G-sensor. 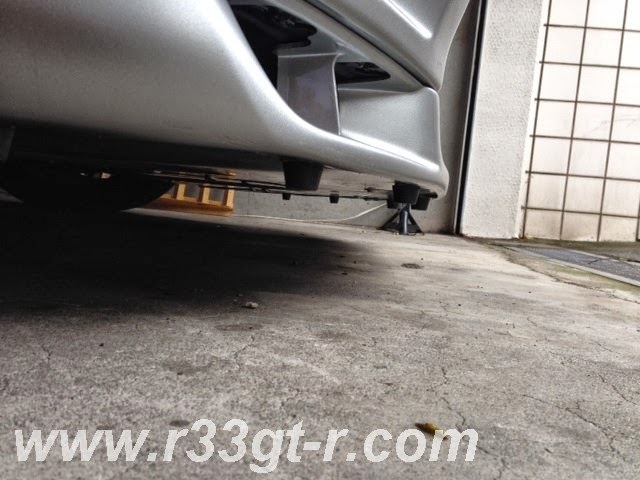 With my car, installation was easier than usual because I had already removed the OEM G sensor. 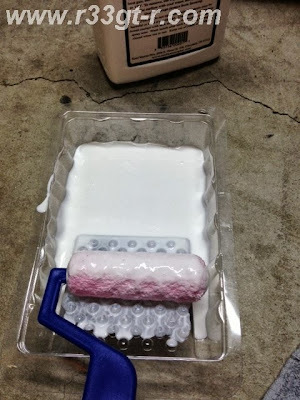 (click on this link for my blog post showing how to). 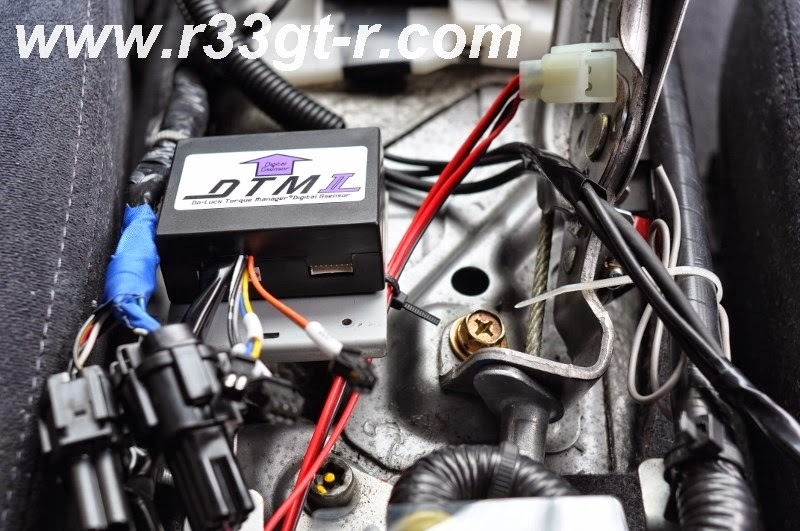 The next step is to wire in the throttle position sensor leads. The instruction manual simply said to "splice in" but when I asked Ito-san about this, he clarified that you cut a particular wire coming out of the ECU loom, and then one wire from the DTM II is connected to one cut side, and the other wire to the other cut side. Found on gtr.co.uk...Refer to the Instructions... they will say "Throttle Output Signal" which is Pin 56 ( I think this is common to the BNR32, BCNR33, and BNR34, but please verify). Once that's done, all you have to do is thread the lead under the carpet so it ends up under the main unit. Wait? What's this? Two EXTRA leads? That's right. Two outputs. There are three input/output leads, one of which connects to the lead coming from the throttle position. The others are labelled "OPT" and "LOG." 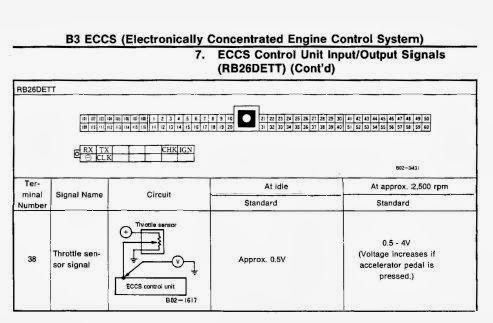 The "OPT" one, Ito-san tells me, will soon allow control of the A-LSD (active LSD) found in the V-Spec models (he's working on how it can be done). 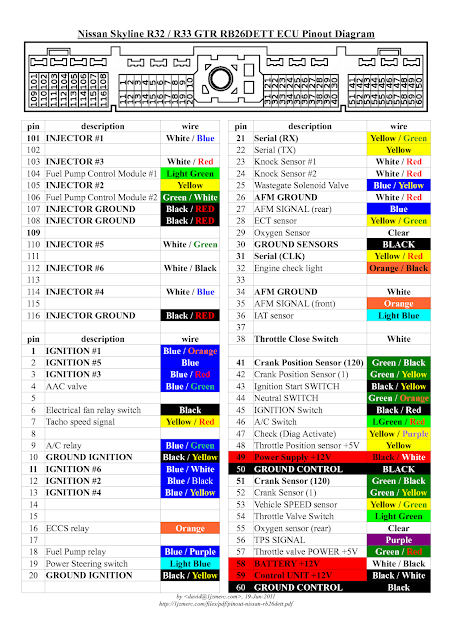 The "LOG" lead is for those who like to datalog what is going on in the car. The unit produces variable voltage according to the front/back and left/right G-forces, and so if you can record that, then you can log this data. Install finished! Quite easy. No messing around with anything that will get your hands dirty (i.e. perfect for me). 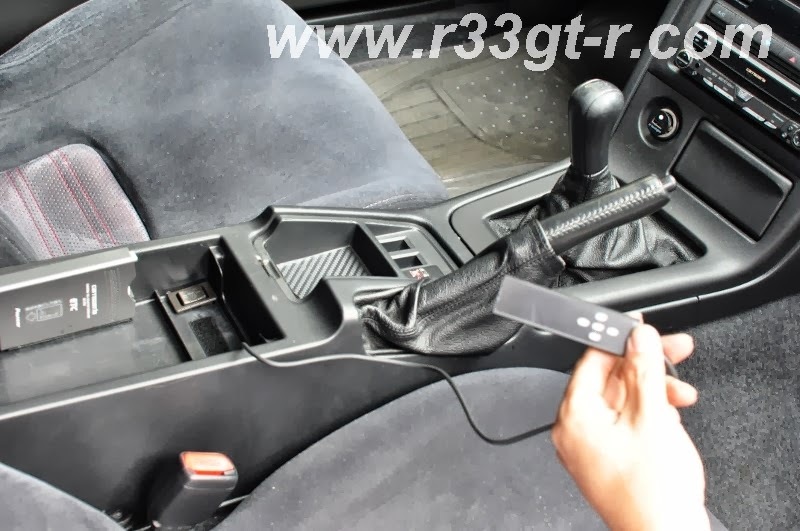 In my next posts, I will go into HOW the DTM II works, how it can be programmed and other details NOT mentioned in the install manual (that I've seen) and yes, my driving impressions (in a word, AWESOME). Trying out "live blogging"... 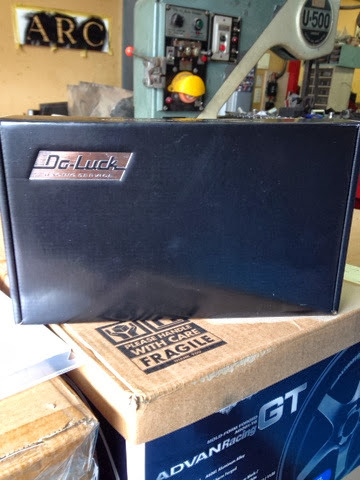 Check back later tonight as I report on the install and my driving impressions of Do-Luck's latest electronic wonder! So while I prefer the look of the OEM Series 3 lip, the drawback is that due to it being 20mm longer than the Series 1/2 lip, it seems to ALWAYS get scraped up. In fact, this is the reason why original buyers of the Series 3 cars were able to order the Series 1/2 lip, as an option from the factory. 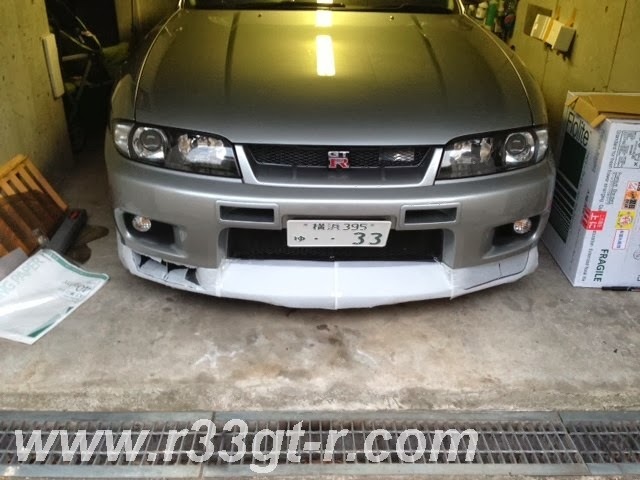 See how much shorter the Series 1 car's lip spoiler is! 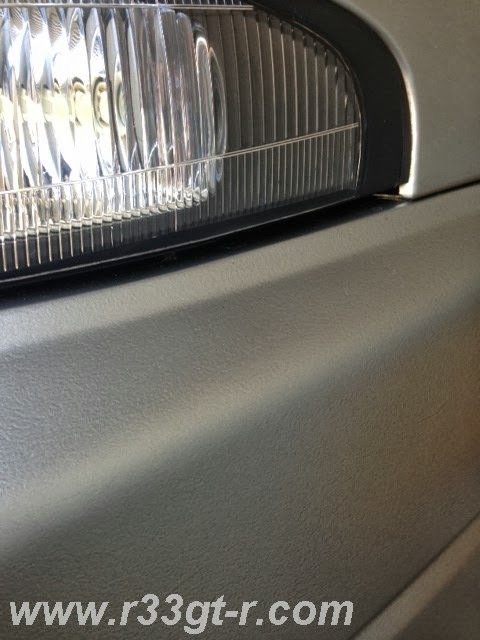 When in its OEM black ABS plastic form, sometimes the scratches aren't very noticeable because they are on the bottom edge, but once you make the decision to paint the lip, then a scratch can no longer be buffed out, or sanded down like ABS plastic can. 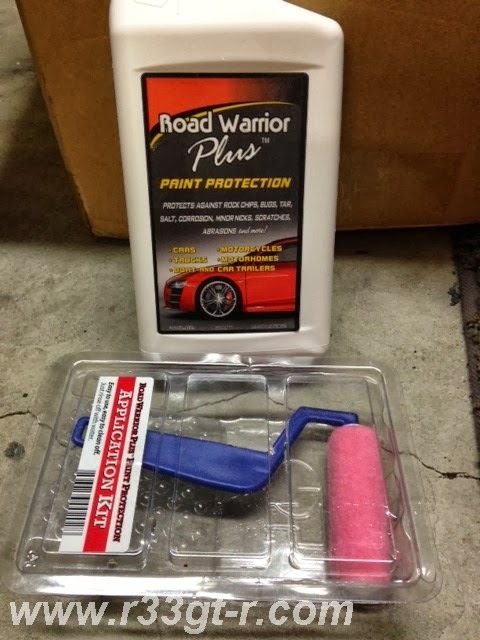 So in my quest to protect the lip spoiler, I am currently experimenting with the Road Warrior Plus paintable clear bra alternative. So far, so good I think. However there is nothing in place to protect the lip from scrapes, in case I end up pulling into a slightly too steep driveway. 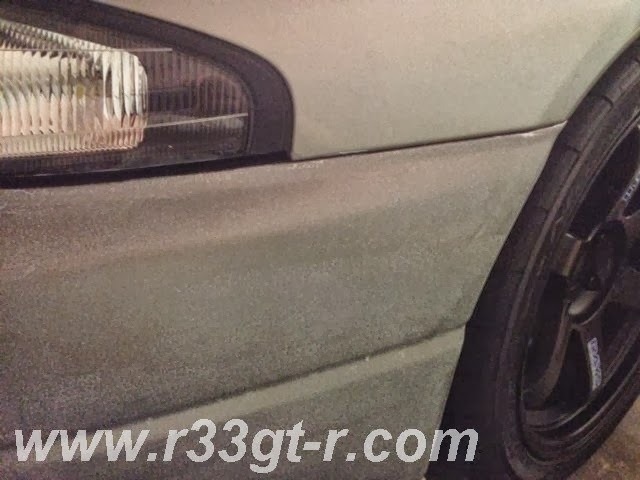 I need something that attaches UNDER the front lip spoiler that can sacrifice itself and give tactile and audible warning when it hits something solid, and cause me to stop (also something that doesn't weigh too much or cause drag is important, too!). 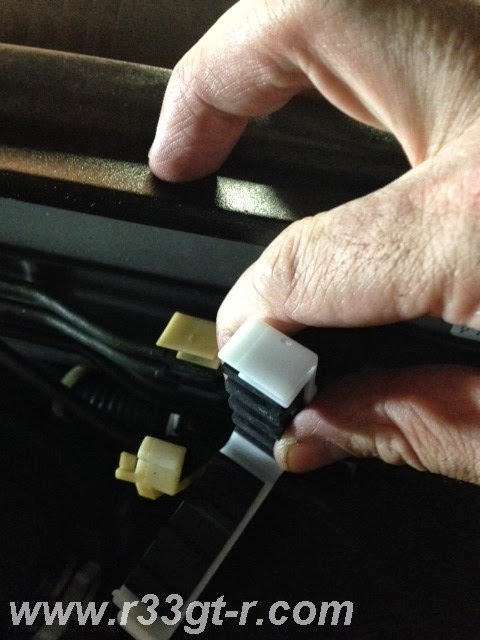 Long time readers will recall that in the past I tried long rubber strips (a Nismo aftermarket part), as well as thin aluminum strips for this purpose. 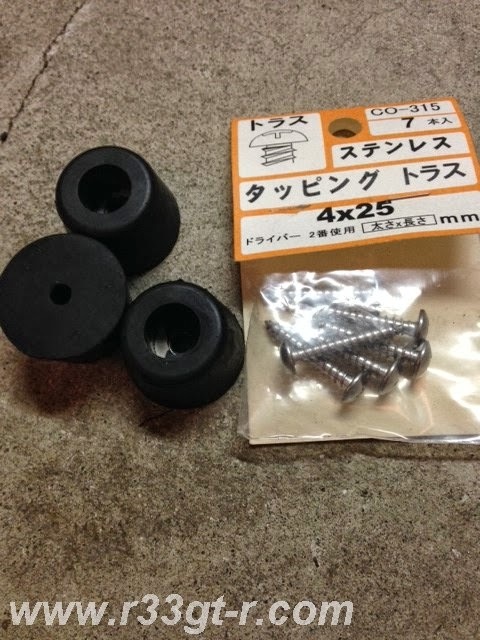 The aluminum worked well initially, but I found that a section would give and break away but other sections would not, creating pieces that would drag on the road, and even end up getting caught up in the wheels. Not good. The reason being I just could not attach them securely enough. I've even done a 3M DIN-OC carbon fiber wrap. When I consulted my engineer friend Andrew Brilliant, his idea was to have a separate frame or section that could absorb the impact without putting stress on the lip spoiler and bumper (like what happened and resulted in my having the bumper and lip spoiler repainted...) Although his idea was too complicated for a simpleton like me, one thing I did decide to follow up on was having something that was "soft" and could "absorb the impact." Very simple, right? 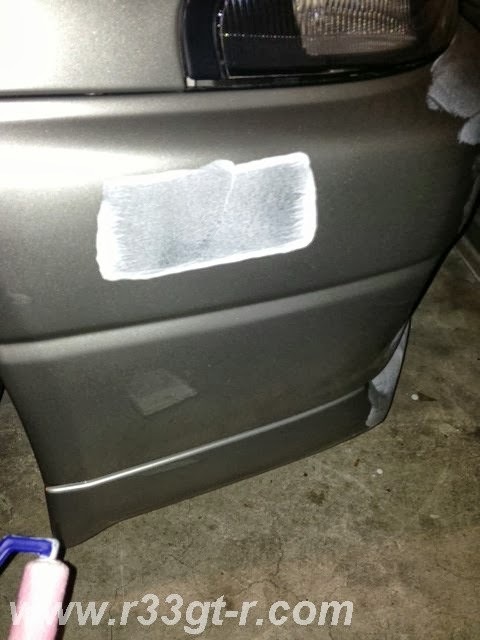 Hopefully these are the lowest points of the front lip spoiler and will drag or catch first. "The R33 is leaner... and more GT looking..."
Unfortunately, not much more about the Skylines...other than, it's one of their "hero cars" which are essentially unobtainable in the USA. Hence, most of the time is spent talking about other cars.... but a few I wouldn't mind having, actually! Well as most of you know I DO like to keep my car clean. 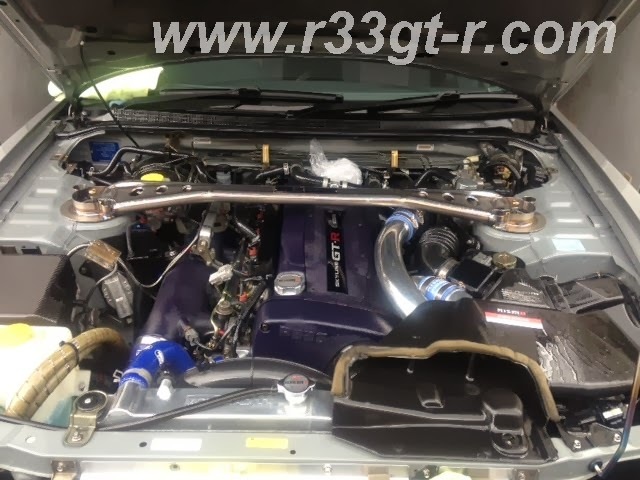 And this means not just the exterior and interior, but also places that are not as obvious, such as the wheel wheels, inside body panels, etc. 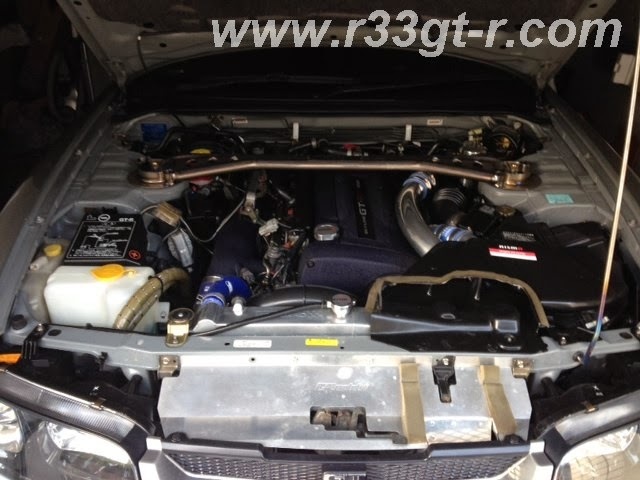 But I realized that lately, I had been neglecting one very obvious area: the engine bay. 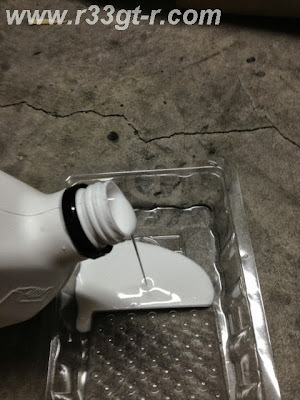 Using some plastic sheets, I protected the sensitive parts from water, and then proceeded to spray down the engine bay. Once dry, I then sprayed on some CD2 protectant that I have had forever (I think I bought it back in 2007?!! 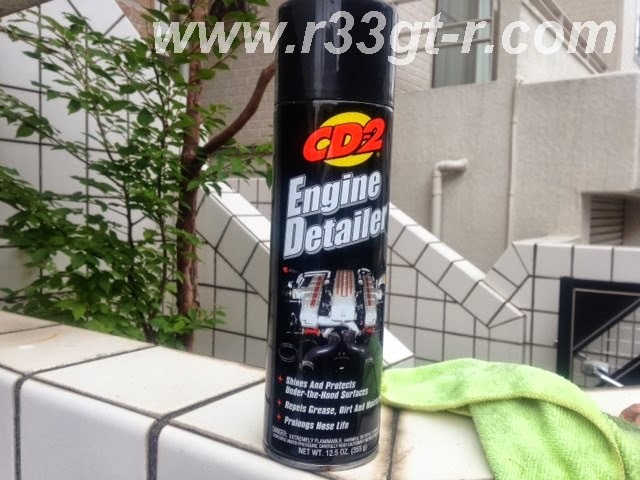 ), and was sitting in my collection of detailing tools. So if you look closely, there are a couple things that bothered me. 2) The plastic clips on the steel brake lines, along the firewall. 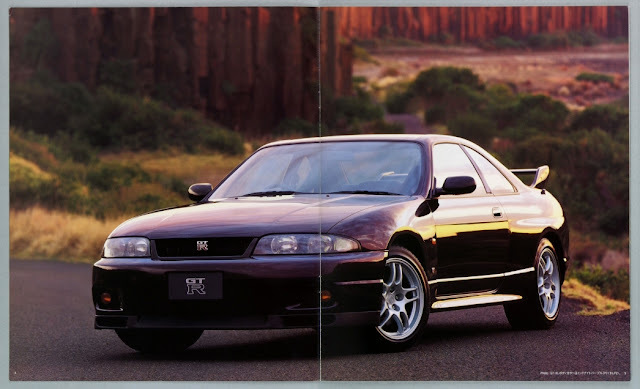 Actually Midori Seibi's Uchinaga-san (the son, R33 owner as well) had pointed that out during my visit to Midori Seibi back in January. 3) The radiator stay. Mine is rusted and has dirt built-up. One is visible, the other is hidden under the air intake snorkel. The two clips, I will use in a future blog entry. Hmm. That new one looks weird. 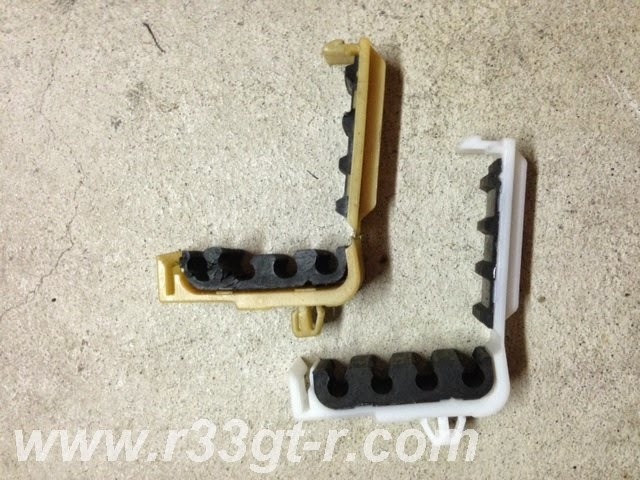 Comparing the plastic clips that hold the brake lines in place! The old ones had turned yellow (and 2 of 3 had cracked) due to the heat of the engine! And here it is installed - I have one more thing I want to do so will have a better picture when I do that mod, but until then, this photo will have to do. So having gotten my car refreshed (i.e. front bumper repainted) recently, this time I'm determined to make sure that the newly painted parts remain as clean and pristine as possible. One solution, of course, is to never drive the car, but this is not practical. 1) Do nothing. 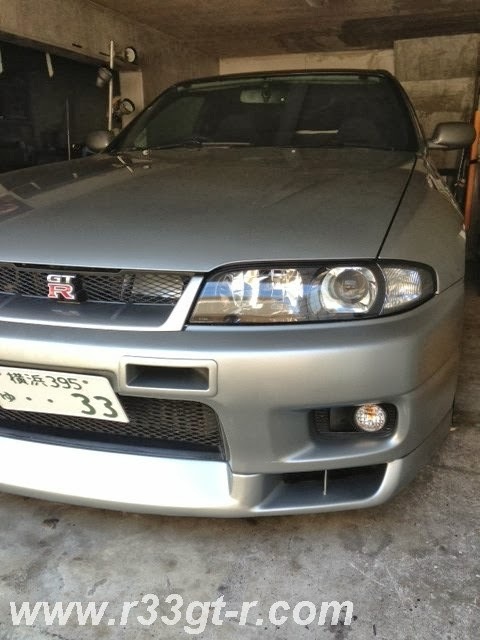 That is, just have the bumper and front lip spoiler repainted every other year or so, whenever the damage becomes an eyesore. 2) Application of 3M Scotchguard Paint Protection clear film. The drawbacks are, however, expense (I have found very few shops in Japan that do this film application which means very expensive), and in this particular situation, the inability to cover all the painted areas, given all the openings, scoops and complex shapes on the front bumper and the lip spoiler. However even though I managed to wrap the front lip spoiler, it never looked right as the cutouts for the front brake ducts were sloppy, and then when I scraped the lip spoiler, the impact left the film scarred and scraped up too. So when the lip spoiler was repainted, it was removed of course. Check back as I experiment with this in the near future! 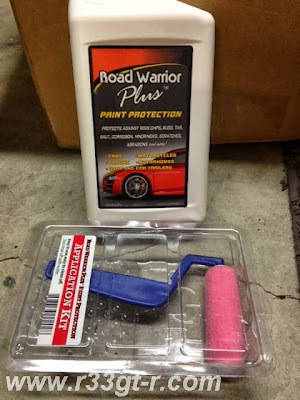 This is the basic kit - the liquid in a quart bottle, plus application tools. This is what I ended up getting. 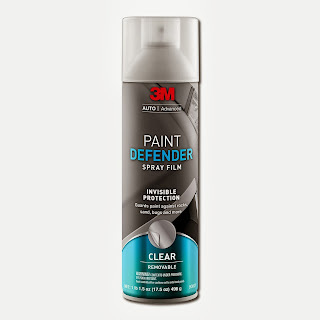 Basically, this is a liquid that you paint onto those car surfaces that you want to protect, and when dry it is supposed to serve the same purpose as the clear film. That is, provide impact protection from stuff on the road. Of course, given its relatively thin (when dry) nature it is marketed more as a temporary solution for track days (apply, race, then peel off) and long distance driving where road debris can be expected to hit at high speed. 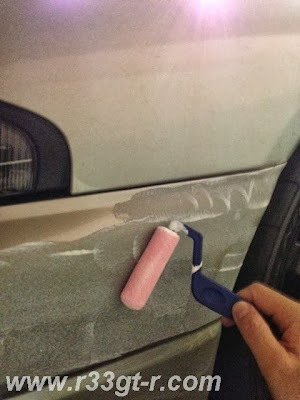 Ingenious in concept, but a) is it really that easy, b) does it look ok when dry, and c) does it work? So I got to work. First, as many reviewers remarked, this stuff DOES smell, and have the same consistency, as Elmer's glue. Ok this roller is cute, but will it do the job? Before pouring the RWP into the tray, I wiped down the front bumper and lip spoiler. Also, I decided to do my left side mirror as well, more to be able to demonstrate to people who ask. Here is what it looks like, in daylight after it is dry. Close up, it looks like really bad orange peel, but it feels like plastic, not paint. There were some areas where I had forgotten to smooth out the liquid well, which resulted in some clumping but in the end they dried clear too. As you can see from far away it doesn't look too bad, I think. Can There Be Too Much Body Rigidity?